Multiple sclerosis (MS), and its animal model experimental autoimmune encephalomyelitis, are neuroinflammatory diseases driven by autoreactive pathogenic TH cells that elicit demyelination and axonal damage. How TH cells acquire pathogenicity and communicate with myeloid cells and cells of the CNS remain unclear. IL-1β is recognized to play an important role in experimental autoimmune encephalomyelitis (EAE) and perhaps MS. Clinical EAE is significantly attenuated in IL-1R–deficient and IL-1β–deficient mice, and IL-1β is found in the blood, cerebrospinal fluid, and CNS lesions of MS patients. In this article, we focus on new reports that elucidate the cellular sources of IL-1β and its actions during EAE, in both lymphoid tissues and within the CNS. Several immune cell types serve as critical producers of IL-1β during EAE, with this cytokine inducing response in both hematopoietic and nonhematopoietic cells. These findings from the EAE model should inspire efforts toward investigating the therapeutic potential of IL-1 blockade in MS. Multiple sclerosis (MS) is a chronic inflammatory disease of the brain and spinal cord that presents clinically with different temporal and pathologic patterns, and results in a variety of neurologic signs and symptoms. Immune cell invasion of the CNS in MS induces both demyelination and axon loss, and involves communication between the invading leukocytes and astrocytes, glia, and neurons. Autoreactive CD4+ T cells play an important role in driving MS pathology, although γδ T cells, CD8+ T cells, and B cells also appear to contribute to disease (1–5). How autoreactive TH cells acquire pathogenicity and how they mediate CNS damage remain important outstanding questions. Current MS therapies mainly target the functions of lymphocytes, but they are not universally effective. Experimental autoimmune encephalomyelitis (EAE) serves as an animal model of MS and can be elicited in several species through active immunization with myelin Ag or via adoptive transfer of T lymphocytes (passive EAE). In recent years the C57BL/6 mouse model of EAE has become the most popular, because it has allowed the use of knockout and transgenic mouse strains on this genetic background. In the most commonly used version of the C57BL/6 EAE model, mice are immunized with a CFA-based emulsion containing a peptide from murine myelin oligodendrocyte glycoprotein (MOG35–55) (6). Although this immunization elicits peptide-specific TH cells, mice must also be systemically injected with pertussis toxin (PTX) as a coadjuvant to induce a monophasic, paralytic clinical disease (7, 8). After EAE induction, priming and differentiation of MOG-specific TH cells take place during the first wk in secondary lymphoid organs. Over subsequent days, these TH cells and blood-derived myeloid cells traffic through the meninges and across the blood–brain barrier (BBB), with clinical signs of disease typically apparent by 10 d postinduction. TH cells are thought to re-encounter their cognate Ag (MOG35–55) in the context of MHC class II (MHC II)-expressing APCs both in the meninges and the CNS parenchyma, with these interactions resulting in the production of pathogenic cytokines by the TH cells, notably GM-CSF (9–11). The IL-1 family of cytokines displays pleiotropic effects on a variety of hematopoietic and nonhematopoietic cells relevant to neuroinflammation. IL-1α is generated constitutively by epithelial cells and induced upon stimulation of most immune cell types (12). IL-1β is produced via both inflammasome-dependent and -independent pathways upon activation of a variety of leukocytes (13–17). Both of these IL-1 family members bind to a single activating receptor complex, composed of the IL-1R1 and IL-1RAcP (the IL-1R accessory protein, also called IL-1R3) chains, each containing a cytosolic Toll/IL-1 receptor homology domain (18). Cytokine binding by this receptor engages the MyD88 signaling cascade, including IRAK1/2/4, TRAF6, and TAK1, to ultimately result in AP-1 and NF-κB activation and proinflammatory gene transcription. Separately, another IL-1 family member, IL-1Ra (also called IL-1RN), functions as a soluble receptor antagonist, capable of binding to IL-1R1. Several members of the IL-1 family of cytokines have been studied in the context of EAE and MS, with initial work in EAE beginning in the late 1980s. In 1987, Symons et al. (19) found increased levels of IL-1 activity, measured at the time by a mouse thymocyte proliferation assay, in the plasma and cerebrospinal fluid of guinea pigs immunized with spinal cord homogenates to induce a chronic relapsing form of EAE. In the same year, using a rat model of passive EAE, Mannie et al. (20) showed lymph node cells from EAE-induced rats treated with human IL-1β were more encephalitogenic, and suggested that this effect was via the action of IL-1β on T lymphocytes. Two later studies found evidence for IL-1α within the spinal cord of mice with EAE (21, 22), and one report showed that IL-1β protein could be detected in rats with EAE within meningeal macrophages, parenchymal-infiltrating macrophages, and activated microglia (23). Subsequent studies in rats showed that recombinant human IL-1α treatment after EAE induction exacerbated clinical disease and that treatment with soluble recombinant murine IL-1R or IL-1Ra could ameliorate disease (24–27). Schiffenbauer et al. (28) first reported that IL-1R–deficient mice (on a mixed genetic background) were resistant to active EAE induction. Their results have been confirmed by several other groups using IL-1R–deficient mice on the C57BL/6 background (29–34), although the degree to which these mice were protected from clinical disease was somewhat variable. Despite one report to the contrary (35), IL-1β appears to be the critical mediator of EAE, rather than IL-1α, because IL-1β–deficient mice were seen to resist EAE (33, 36), whereas IL-1α–deficient mice remained susceptible (33, 35). For this reason, the remainder of this review will focus on IL-1β, although whether IL-1α plays any role in MS remains an open question. Consistent with a critical requirement for IL-1β for EAE susceptibility, mice deficient in the inflammasome components NLRP3 (37–41), ASC (36, 39, 42), caspase 1 (42, 43), and caspase 11 (44) were also at least partially resistant to EAE, as were mice treated with inhibitors of NLRP3 (45, 46) or caspase 1 (47). It is worth noting that in some reports (40–42), mice immunized with larger amounts of heat-killed Mycobacterium tuberculosis (usually >300 μg per mouse) as part of the MOG35–55/CFA emulsion developed an NLPR3- and ASC-independent form of aggressive EAE. However, this form of EAE still appears to be IL-1β– and IL-1R–dependent, given that the experiments in IL-1β– and IL-1R–deficient mice that demonstrated EAE resistance were typically performed with large amounts of heat-killed M. tuberculosis (29–34, 36). Beginning in 1990, reports emerged showing that IL-1β protein or IL1B transcript could be detected in the cerebrospinal fluid (48, 49) or within CNS lesions of MS patients (50–55). More recently, these findings were extended by Seppi et al. (56), who showed that cerebrospinal fluid levels of IL-1β correlate with the number and volume of brain cortical demyelinating lesions, and by Rossi et al. (57), who showed that relapsing-remitting MS (RRMS) patients with detectable IL-1β in the cerebrospinal fluid at the time of clinical remission had a more severe course of disease. In addition, transcript levels of IL1B and two inflammasome components (CASP1 and NLRP3) were more highly expressed by PBMCs from MS patients compared with healthy control subjects (58–60). Collectively, although these results indicate that IL-1β expression in the CNS and blood is associated with disease activity in MS, they do not establish a causal role for the cytokine in disease pathogenesis. This review will therefore focus on the mouse model of EAE, where several groups have begun to elucidate the mechanism of action of IL-1β (Fig. 1). The cellular sources of IL-1β and its target cells during EAE. In the EAE model in C57BL/6 mice, animals are immunized with MOG35–55/CFA s.c. and treated with PTX systemically. Five to eight days after immunization, IL-1β is primarily produced by CD11b+Ly6Cmid-hiMHC IIlo-hi moDCs/Macs in the peripheral DLNs. Activated CD4+ T cells have also been recently appreciated to be cellular sources of IL-1β. Although T cell–derived IL-1β is dispensable for CD4+ T cell priming in DLNs before disease onset, IL-1β derived from pathogenic T cells may be important to initiate inflammation within the CNS. IL-1β production from meningeal mast cells has also been shown to be critical for EAE susceptibility and CD4+ T cell encephalitogenicity. Neutrophils and moDCs/Macs also produce IL-1β in the CNS. Multiple cell types respond to IL-1β during EAE. IL-1β enhances Bhlhe40 expression and GM-CSF production by CD4+ T cells in both the DLNs and the CNS, and promotes T cell pathogenicity. Most of the myeloid cell subsets in the DLNs express IL-1R, but whether they respond to IL-1β to facilitate disease progression is unclear. In the CNS, IL-1β can stimulate astrocytes to secrete chemokines, which may recruit and activate leukocytes. Action of IL-1β on CNS endothelial cells facilitates cytokine production and neutrophil adhesion. Small arrows indicate cytokine or chemokine production. Large red and blue arrows indicate the actions of IL-1β and GM-CSF, respectively. More than two decades ago it was first suggested that CNS macrophages and microglia express IL-1β in rats with EAE (23), although more recent mouse experiments demonstrated that CNS-infiltrating Ly6C+ macrophages, but not resident microglia, were producers of this cytokine (61). Examining IL-1β production in the CNS more carefully using pro–IL-1β reporter mice, Lévesque et al. (33) identified neutrophils and monocyte-derived macrophages as the primary cell subsets expressing IL-1β in the spinal cord after clinical disease onset. These authors also found that transmigration through the blood–spinal cord barrier triggered pro–IL-1β expression by neutrophils, and that at day 7 after EAE induction, IL-1β–producing neutrophils were found in the blood. We and others also found IL-1β–producing myeloid cells in peripheral lymphoid organs at days 5–8 after EAE induction (31, 32, 36, 62). These reports collectively identified a population of CD11b+Ly6Cmid-hiMHC IIlo-hi monocyte-derived dendritic cells/macrophages (moDCs/Macs) as the main source of IL-1β in draining lymph nodes (DLNs) and showed that these cells increase dramatically after MOG35–55/CFA immunization given with PTX coadjuvant. We and the laboratories of Sallusto and Waisman (32, 34, 36) explicitly showed a requirement for PTX to yield IL-1β production from this DLN cell population, by comparing MOG35–55/CFA immunizations with and without PTX. Although the details of how PTX induces DLN cells to generate IL-1β are not clear, Dumas et al. (63) had previously shown that i.p. PTX alone was sufficient to induce IL-1β production by macrophages and neutrophils in the peritoneum within a few hours after injection. It is noteworthy that in our experiments (32), we found that DLN cells collected at day 7 from mice that were immunized with MOG35–55/CFA produced little IL-1β, even when re-exposed to the immunogenic component of CFA, heat-killed M. tuberculosis, ex vivo. In contrast, DLN cells collected from mice immunized with MOG35–55/CFA given with systemic administration of PTX produced a small amount of IL-1β ex vivo, which was greatly augmented by re-exposure to heat-killed M. tuberculosis. Overall, these results suggest that PTX is essential for the generation of IL-1β–producing cells in vivo in the C57BL/6 EAE model and help to explain the requirement for this coadjuvant to yield clinical disease. Another recent finding relevant to IL-1β production by myeloid cells came from Gao et al. (64), who confirmed that CD47-deficient mice were resistant to EAE (65) and showed that CD47’s role was hematopoietic cell–intrinsic. CD47 is a transmembrane protein of the Ig superfamily that can associate with integrins in cis and can bind the membrane ligand SIRPα in trans or the soluble ligand thrombospondin-1. In vitro experiments showed that LPS plus ATP treatment resulted in less caspase 1 activation and less IL-1β production by CD47-deficient macrophages, and serum from CD47-deficient mice contained less IL-1β after EAE induction. Mechanistic studies demonstrated that CD47 appears to repress NO production in macrophages, which, in turn, allows full inflammasome activation and mature IL-1β generation. These data highlight the fact that there are likely several signaling pathways that integrate to result in maximal IL-1β production by myeloid cells during EAE. In 2000, Brown and colleagues (66) showed that mast cells play an important role in the MOG35–55 model of EAE based on studies with mast cell–deficient WBB6F1-KitW/Wv mice, which displayed a reduced incidence and severity of disease. Selective reconstitution of meningeal mast cells by intracranial injection of bone marrow–derived mast cells could restore EAE susceptibility in these mice, pointing to a particular role for mast cells at this anatomic location (67). Analysis of meningeal responses to EAE induction found that Il1b transcripts in the meninges of wild-type (WT) mice increased after EAE induction, with mast cells as a likely source, given that this increase was not seen in mast cell–deficient mice (68). 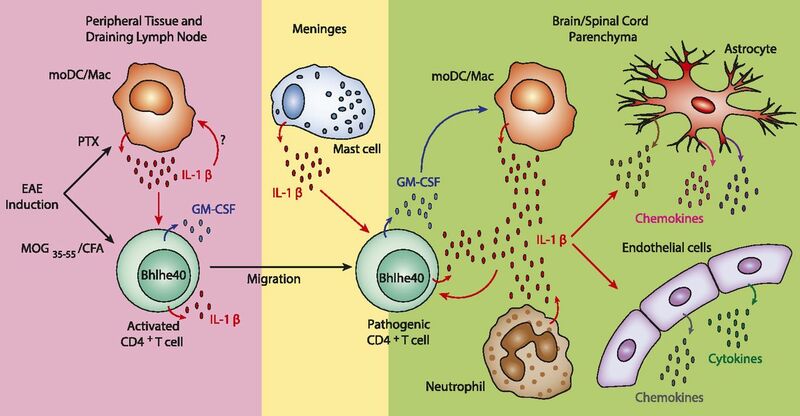 More recently, Brown’s group (69, 70) showed that reconstitution of meningeal mast cells with bone marrow–derived mast cells from caspase 1–deficient mice could not restore EAE susceptibility or CD4+ T cell encephalitogenicity, likely indicating that IL-1β from these cells contributes to disease pathogenesis. A recent in vitro study also showed that activated human mast cells secrete IL-1β and thus promote IL-17 production by CD4+ T cells (71). IL-1β production by T cell has recently been appreciated. Using flow cytometry, McCandless et al. (72) first showed that a majority of spinal cord–infiltrating CD4+ T cells, CD8+ T cells, and γδ T cells express pro–IL-1β during early EAE. A second study showed that in the cerebellum during EAE, CD3+ T cells expressed IL-1β as assessed by immunofluorescent microscopy and that splenic T cells secreted IL-1β (73). TH cells from EAE-induced mice found in secondary lymphoid organs analyzed at day 7 after immunization produced IL-1β after Ag restimulation in the presence of either IL-12 or the combination of IL-23 and IL-1β (74). A true requirement for TH cell–intrinsic production of IL-1β during EAE was elegantly shown through the use of ASC conditional knockout mice (Ascfl/flLck-Cre), in which T cell–specific deletion of ASC resulted in almost complete resistance to active EAE (75). This was corroborated by the fact that Rag1-deficient mice reconstituted with Il1b-deficient CD4+ T cells also did not develop EAE after immunization. EAE induction in Ascfl/flLck-Cre mice resulted in normal CD4+ T cell priming and cytokine production in DLNs at day 10 after immunization, suggesting that non–T cell sources of IL-1β were sufficient before this time point to instruct priming. When in vivo primed Ascfl/flLck-Cre CD4+ T cells were cultured with MOG35–55 in TH1 polarizing conditions, they were fully capable of adoptively transferring EAE, but culture of these cells in TH17 conditions resulted in nonpathogenic cells. These results highlighted a surprising role for intrinsic IL-1β production, specifically by TH17 cells during the effector phase of EAE, probably through autocrine action of this cytokine within the CNS. Interestingly, TH17 cell production of mature IL-1β was stimulated by ATP and required a caspase 8–containing inflammasome, rather than caspase 1. Taken all together, after EAE induction, multiple immune cell types at different times and anatomic locations must secrete IL-1β to promote clinical disease development. Unlike naive TH cells, in vitro polarized TH17 cells express high levels of the IL-1R (TH1 and TH2 cells express only low levels) (76, 77). After EAE induction, IL-17A–producing, as well as IFN-γ– and GM-CSF–producing, CD4+ T cells in the DLNs show higher IL-1R1 expression compared with Foxp3+ regulatory T cells (34). Because IL-1R1 knockout mice resisted active EAE induction but were susceptible to EAE when they served as recipients for adoptively transferred IL-1R–sufficient MOG-specific TH17 cells, Sutton et al. (29) reasoned that TH17 cells themselves must be critical responders to IL-1β. Furthermore, Rag1-deficient mice reconstituted with IL-1R1–deficient CD4+ T cells (77) and mice with T cell–specific ablation of IL-1R1 (Il1r1fl/flCd4-Cre) developed milder clinical EAE after immunization (34), confirming a TH cell–intrinsic role for IL-1 responsiveness. Ghoreschi et al. (78) demonstrated that IL-1β in combination with IL-6 and IL-23 was critically required for the generation of pathogenic TH17 cells using a system of adoptively transferred in vitro polarized MOG-specific 2D2 TCR transgenic TH cells. Tracking IL-17A–producing cells during EAE through a fate-mapping approach confirmed that TH17 cells, but not TH1 cells, expressed IL-1R1, and that these cells responded to IL-1β by producing large amounts of IL-17A (79). Interestingly, this approach also revealed an abundant population of IL-1R1–expressing ex-TH17 cells that increased with disease progression and that no longer produced IL-17, but instead secreted IFN-γ in response to IL-1β. Given that adoptive transfer studies had shown that neither IL-17 nor IFN-γ were absolutely required for passive EAE development (80, 81), the earlier studies did not provide a clear explanation for how IL-1 responsiveness led to TH cell encephalitogenicity. Two reports provided evidence that TH cell–derived GM-CSF was essential for pathogenicity in adoptive transfer EAE models, even in the combined absence of IL-17A and IFN-γ (80, 81), and one of these (81) showed that IL-1β strongly enhanced GM-CSF production by TH17 cells. Lukens et al. (30) soon thereafter showed that TH and γδ T cells from EAE-induced IL-1R1–deficient mice (which were highly resistant to EAE) failed to produce GM-CSF, although it remained unproven that IL-1R signaling was cell-intrinsically required by TH cells for production of GM-CSF. This final point was made by Croxford et al. (31), who showed that after EAE induction, IL-1R–deficient TH cells were less represented among the GM-CSF–producing TH cell population in IL-1R1 WT/IL-1R1–deficient mixed bone marrow chimeric mice. Work from J. Bluestone’s group (82) and our own laboratory (83) have shown a TH cell–intrinsic requirement for the basic helix-loop-helix transcription factor Bhlhe40 (also known as DEC1, Stra13, Sharp2, and Bhlhb2) for EAE susceptibility. In each of these reports, Bhlhe40-deficient TH cells were found to produce less GM-CSF, consistent with the aforementioned work linking GM-CSF to TH cell encephalitogenicity. As a follow-up to these studies, our laboratory analyzed the expression of Bhlhe40 in TH cells during EAE using Bhlhe40 BAC transgenic GFP reporter mice (Bhlhe40GFP) (32). GFP expression was notable in cytokine-producing TH cells within secondary lymphoid organs and the CNS during EAE, but was poorly induced if PTX was not administered at the time of immunization. In vitro cultures of TH17 cells revealed that IL-1β served as a strong stimulus for Bhlhe40 expression, and in vivo IL-1 neutralization or IL-1R1 deficiency impaired expression of the GFP reporter. More recently, to further test whether TH cell–intrinsic IL-1R signaling was required for optimal Bhlhe40 expression in autoreactive cells, we cotransferred congenically marked 2D2.Bhlhe40GFP and 2D2.Bhlhe40GFP.Il1r1−/− TH cells to WT recipients and immunized these mice with MOG35–55/CFA given along with PTX (C.-C. Lin and B.T. Edelson, unpublished observations). At 7 d postimmunization, IL-1R1–deficient 2D2 cells expressed significantly less GFP than IL-1R1–sufficient cells in the DLN. Overall, these data indicate the presence of a pathway whereby PTX induces IL-1β, which acts on autoreactive TH cells to induce Bhlhe40 expression and subsequent encephalitogenicity (Fig. 1). Given the importance of IL-1R signaling for TH17 cell pathogenicity, it is interesting to consider which pathways regulate expression of this receptor by these cells. Among the cytokines required for TH17 cell differentiation in vitro, IL-6, but not TGF-β or IL-23, strongly induced Il1r1 transcripts in naive CD4+ T cells activated by anti-CD3 and anti-CD28 (77). Not surprisingly, IL-1R expression was severely impaired in TH cells lacking STAT3, the primary transcription factor downstream of IL-6R signaling. Recent reports have identified three novel TH17 cell–intrinsic positive regulators of IL-1R expression, including the signaling regulator Spry4 (84), microRNA (miR) cluster miR-183-96-182 (85), and IL-1R signaling itself (64). Fukaya et al. (84) found that Spry4-deficient mice were partially resistant to active EAE and that TH17 cells from these mice were unable to elicit passive EAE. Spry4-deficient TH17 cells expressed lower levels of IL-1R, and overexpression of Spry4 increased expression of the Il1r1 transcript. Spry4 may carry out this regulation via inhibition of MEK and protein kinase C pathways. Ichiyama et al. (85) found that the microRNA cluster miR-183-96-182 (miR-183C) was expressed specifically in TH17 cells cultured in conditions that favor encephalitogenicity (IL-1 + IL-6 + IL-23). TH17 cells from miR-183C–deficient mice produced less IL-17 and GM-CSF and were less pathogenic. The 3′ untranslated region of the transcription factor Foxo1 was found to be a target of all three miRs in this cluster such that miR-183C–deficient TH17 cells expressed increased levels of Foxo1, which, in turn, directly repressed expression of Il1r1. Lastly, Gao et al. (64) found that addition of IL-1β to TH17 cells led to increased expression of Il1r1, supporting the existence of a feed-forward circuit that reinforces TH17 cell pathogenicity. Several lines of evidence indicate that cells other than TH cells also respond to IL-1β to promote EAE pathogenesis. Ronchi et al. (36) tracked transferred 2D2 cells in MOG35–55/CFA-immunized hosts treated with systemic PTX and found that these autoreactive TH cells were less abundant and less frequently expressed both IFN-γ and GM-CSF in the DLNs of IL-1R–deficient recipients when compared with IL-1R1–sufficient recipients. Likewise, Mufazalov et al. (34) found that mice globally deficient for IL-1R were more resistant to clinical EAE than those with only T cell–specific ablation of IL-1R1 (Il1r1fl/flCd4-Cre). Finally, bone marrow chimera studies have shown that IL-1R signaling by radioresistant cells contributes to EAE pathogenesis (33, 72). Collectively, these studies suggest the possibility that hematopoietic non-TH cells, radioresistant microglia, and/or radioresistant nonhematopoietic cells all may respond to IL-1β to enhance neuroinflammation during EAE. Future studies using Il1r1fl/fl mice (34, 86–88) crossed to additional Cre-expressing strains should be useful to dissect the roles of the aforementioned cell types. With regard to nonhematopoietic cell types, data exist supporting the notion that IL-1β acts directly on astrocytes and/or CNS endothelial cells to result in leukocyte recruitment and BBB or blood–spinal cord barrier disruption, processes that may contribute to neuroinflammation in EAE. Argaw et al. (54) identified a pathway whereby IL-1β promoted BBB permeability, possibly through its action on astrocytes to induce their production of VEGF-A. More specific actions of IL-1β on astrocytes were also shown by others to include the stimulation of chemokine production (CCL2, CCL20, CXCL2), which might recruit and activate leukocytes (89, 90). Work from the groups of Quan and Lacroix (33, 91), however, did not observe expression of IL-1R1 on GFAP-expressing astrocytes, and instead found its expression largely restricted to CNS endothelial cells. Lacroix’s group (33, 92) further showed that this receptor was present specifically on venules at the pial venous plexus, corresponding to a site of myeloid cell infiltration during EAE. Action of IL-1β on endothelial cells appears to make them receptive to firm adhesion with neutrophils (93) and induces their secretion of a variety of cytokines and chemokines (33). Specific knockdown of IL-1R1 on Tie2+ endothelial cells attenuates clinical EAE, further supporting the proencephalitogenic action of IL-1β on these cells (94). Although experiments in EAE have provided significant insight into the pathogenic role of IL-1β in this disease model, less is known about the contribution of this cytokine to the pathogenesis of MS. Numerous studies have detected IL-1β or its transcript in the brain, cerebrospinal fluid, or blood of MS patients, although the cellular sources of IL-1β are not clear. Likewise, whether a specific environmental stimulus drives IL-1β production in MS, akin to how PTX acts in EAE, is unknown. Some reports have analyzed the actions of IL-1β on human cells, and these serve as a framework for understanding its potential pathogenic role in MS. IL-1β can act on subsets of human TH cells expressing the IL-1R (95), and receptor expression can be increased by IL-7, IL-15, and TGF-β (96). In vitro polarization of naive human TH cells in a mixture containing IL-1β induces IL17A, IL17F, IL21, IL22, IRF4, RORC, IL1R1, and IL23R expression in an IL-1R–dependent manner (97). Furthermore, IL-1β treatment of activated human TH17 cells increases the fraction of GM-CSF/IFN-γ/IL-17 multicytokine-producing cells (98), which are thought to play a pathogenic role in several autoimmune disorders including MS, rheumatoid arthritis, and inflammatory bowel disease. Recently, both naive and memory TH cell subsets from MS patients were found to express higher levels of IL1R1 than cells from healthy control subjects, potentially suggesting increased responsiveness to this cytokine in MS (97). In addition, human astrocytes express CXCL12, IL6, CCL2, CCL5, PTGS2, and TLR2 in response to IL-1β treatment (99, 100). Future studies should aim to more fully determine whether IL-1β plays a pathogenic role in MS, perhaps in specific patient subsets or at specific stages in the disease process. Many studies have observed that therapeutic agents used to treat MS affect IL-1Ra and/or IL-1β production. These include the commonly used drugs type I IFN, glatiramer acetate (GA), and natalizumab (anti–VLA-4). Treating RRMS and progressive MS patients with IFN-β significantly increased IL-1Ra in the serum (101–103). In vitro, IFN-β treatment of human PBMCs or monocytes promoted IL-1Ra but inhibited IL-1β production (104, 105). Using murine bone marrow–derived macrophages, Guarda et al. (106) showed that IFN-β indirectly limited pro–IL-1β abundance by inducing IL-10 expression and directly prevented IL-1β maturation by repressing inflammasome activation. Inoue et al. (40) also found an alternative mechanism whereby IFN-β reduced IL-1β maturation in macrophages, through induction of SOCS-1 and subsequent inhibition of Rac1. Rac1 inhibition led to reduced reactive oxygen species generation, and thus less activation of the NLRP3 inflammasome. Like IFN-β, GA increased serum IL-1Ra levels in RRMS patients and stimulated IL-1Ra, but suppressed IL-1β, production when applied to human monocytes in vitro (107, 108). The regulation of IL-1Ra by GA in monocytes required both MEK/ERK and PI3Kδ pathways, whereas IFN-β relied on an MEK2/PI3Kδ pathway to induce IL-1Ra (109, 110). Natalizumab is an mAb targeting the integrin VLA-4, and thus prevents the entry of peripheral leukocytes into the CNS. Treating MS patients with natalizumab led to lower levels of IL-1β in the cerebrospinal fluid (111, 112). Collectively, these findings suggest that regulating IL-1 family proteins may serve as one mechanism of action used by several currently approved treatments. Numerous studies have shown that inflammasome inhibition or IL-1R signaling blockade alleviates EAE severity and/or delays disease onset (24–27, 45, 46, 73, 93, 113). It has been proposed that drugs interrupting IL-1R signaling may be therapeutically useful as treatment for MS (92, 114). Although no small-molecule inhibitors have been generated to specifically block this signaling pathway, anakinra (rIL-1Ra) has been approved by the U.S. Food and Drug Administration to treat rheumatoid arthritis and appears to be relatively safe with few serious adverse reactions (115, 116). We suggest that targeting the production or actions of IL-1 in both secondary lymphoid organs and within the CNS be considered as new therapeutic opportunities for MS treatment. This review has highlighted recent reports demonstrating the production of IL-1β in EAE by myeloid cells, mast cells, and T cells, and the response to this cytokine by both immune and nonhematopoietic cells. Several unanswered questions remain open to further experimentation. For example, how does PTX induce IL-1β production by monocytes and neutrophils, and what other stimuli can trigger IL-1β production by these cells? Also, it will be interesting to determine whether myeloid cells themselves respond to this cytokine in an autocrine and/or paracrine manner to facilitate disease progression. The anatomic location of these cells during different phases of disease should also be considered. Because recent reports have shown T cells to produce IL-1β during EAE, it will be important to understand more fully the signals inducing this source of the cytokine. Lastly, many questions remain about the pathogenic role of IL-1β in MS and whether autoreactive subsets of human T cells respond to this cytokine to express GM-CSF or other proinflammatory cytokines. This work was supported by National Institutes of Health Grant R01 AI113118 (to B.T.E. ), a Burroughs Wellcome Fund Career Award for Medical Scientists (to B.T.E. ), and the McDonnell International Scholars Academy at Washington University (to C.-C.L.).
. 2016. The emerging roles of gamma-delta T cells in tissue inflammation in experimental autoimmune encephalomyelitis. Front. Immunol. 7: 14.
. 2015. Involvement of CD8(+) T cells in multiple sclerosis. Front. Immunol. 6: 604.
. 2015. CD8(+) T-cells as immune regulators of multiple sclerosis. Front. Immunol. 6: 619.
. 2016. The search for the target antigens of multiple sclerosis, part 2: CD8+ T cells, B cells, and antibodies in the focus of reverse-translational research. Lancet Neurol. 15: 317–331.
. 2015. B cells are multifunctional players in multiple sclerosis pathogenesis: insights from therapeutic interventions. Front. Immunol. 6: 642.
. 2006. Active induction of experimental allergic encephalomyelitis. Nat. Protoc. 1: 1810–1819.
. 1973. Experimental allergic encephalomyelitis in inbred and outbred mice. J. Immunol. 110: 139–143.
. 2013. Communication between pathogenic T cells and myeloid cells in neuroinflammatory disease. Trends Immunol. 34: 114–119.
. 2015. GM-CSF in neuroinflammation: licensing myeloid cells for tissue damage. Trends Immunol. 36: 651–662.
. 2016. GM-CSF: from growth factor to central mediator of tissue inflammation. Immunity 45: 963–973.
. 2016. Interleukin 1α and the inflammatory process. Nat. Immunol. 17: 906–913.
. 1992. Molecular cloning of the interleukin-1 beta converting enzyme. Science 256: 97–100.
. 1992. A novel heterodimeric cysteine protease is required for interleukin-1 beta processing in monocytes. Nature 356: 768–774.
. 2013. The secretion of IL-1β and options for release. Semin. Immunol. 25: 425–429.
. 2015. Inflammasome-independent regulation of IL-1-family cytokines. Annu. Rev. Immunol. 33: 49–77.
. 2013. The interleukin-1 receptor family. Semin. Immunol. 25: 394–407.
. 1987. Cerebrospinal fluid interleukin 1 like activity during chronic relapsing experimental allergic encephalomyelitis. Clin. Exp. Immunol. 68: 648–654.
. 1987. Interleukin 1 and myelin basic protein synergistically augment adoptive transfer activity of lymphocytes mediating experimental autoimmune encephalomyelitis in Lewis rats. J. Immunol. 138: 4229–4235.
. 1991. Cytokines in the central nervous system of mice during chronic relapsing experimental allergic encephalomyelitis. Cell. Immunol. 134: 505–510.
. 1992. Analysis of cytokine mRNA expression in the central nervous system of mice with experimental autoimmune encephalomyelitis reveals that IL-10 mRNA expression correlates with recovery. J. Immunol. 149: 2496–2505.
. 1993. Demonstration of interleukin-1 beta in Lewis rat brain during experimental allergic encephalomyelitis by immunocytochemistry at the light and ultrastructural level. J. Neuroimmunol. 48: 13–21.
. 1991. Experimental autoimmune encephalomyelitis is exacerbated by IL-1 alpha and suppressed by soluble IL-1 receptor. J. Immunol. 146: 2983–2989.
. 1995. Protective effect of the interleukin-1 receptor antagonist (IL-1ra) on experimental allergic encephalomyelitis in rats. J. Neuroimmunol. 61: 241–245.
. 1998. Interleukin-1 receptor antagonist suppresses experimental autoimmune encephalomyelitis (EAE) in rats by influencing the activation and proliferation of encephalitogenic cells. J. Neuroimmunol. 85: 87–95.
. 1998. Combined treatment of acute EAE in Lewis rats with TNF-binding protein and interleukin-1 receptor antagonist. Exp. Neurol. 149: 455–463.
. 2000. The induction of EAE is only partially dependent on TNF receptor signaling but requires the IL-1 type I receptor. Clin. Immunol. 95: 117–123.
. 2006. A crucial role for interleukin (IL)-1 in the induction of IL-17-producing T cells that mediate autoimmune encephalomyelitis. J. Exp. Med. 203: 1685–1691.
. 2012. Inflammasome-derived IL-1β regulates the production of GM-CSF by CD4(+) T cells and γδ T cells. J. Immunol. 188: 3107–3115.
. 2015. The cytokine GM-CSF drives the inflammatory signature of CCR2(+) monocytes and licenses autoimmunity. Immunity 43: 502–514.
. 2016. IL-1-induced Bhlhe40 identifies pathogenic T helper cells in a model of autoimmune neuroinflammation. J. Exp. Med. 213: 251–271.
. 2016. Myeloid cell transmigration across the CNS vasculature triggers IL-1β-driven neuroinflammation during autoimmune encephalomyelitis in mice. J. Exp. Med. 213: 929–949.
. 2017. IL-1 signaling is critical for expansion but not generation of autoreactive GM-CSF+ Th17 cells. EMBO J. 36: 102–115.
. 2006. Abnormal T cell activation caused by the imbalance of the IL-1/IL-1R antagonist system is responsible for the development of experimental autoimmune encephalomyelitis. Int. Immunol. 18: 399–407.
. 2016. Experimental priming of encephalitogenic Th1/Th17 cells requires pertussis toxin-driven IL-1β production by myeloid cells. Nat. Commun. 7: 11541.
. 2010. NLRP3 plays a critical role in the development of experimental autoimmune encephalomyelitis by mediating Th1 and Th17 responses. J. Immunol. 185: 974–981.
. 2010. The inflammasome sensor, NLRP3, regulates CNS inflammation and demyelination via caspase-1 and interleukin-18. J. Neurosci. 30: 15811–15820.
. 2012. NLRP3 inflammasome induces chemotactic immune cell migration to the CNS in experimental autoimmune encephalomyelitis. Proc. Natl. Acad. Sci. USA 109: 10480–10485.
. 2012. Interferon-β therapy against EAE is effective only when development of the disease depends on the NLRP3 inflammasome. Sci. Signal. 5: ra38.
. 2016. An interferon-β-resistant and NLRP3 inflammasome-independent subtype of EAE with neuronal damage. Nat. Neurosci. 19: 1599–1609.
. 2010. Cutting edge: critical role for PYCARD/ASC in the development of experimental autoimmune encephalomyelitis. J. Immunol. 184: 4610–4614.
. 2001. Caspase-11 mediates oligodendrocyte cell death and pathogenesis of autoimmune-mediated demyelination. J. Exp. Med. 193: 111–122.
. 2014. Activating cannabinoid receptor 2 alleviates pathogenesis of experimental autoimmune encephalomyelitis via activation of autophagy and inhibiting NLRP3 inflammasome. CNS Neurosci. Ther. 20: 1021–1028.
. 2015. A small-molecule inhibitor of the NLRP3 inflammasome for the treatment of inflammatory diseases. Nat. Med. 21: 248–255.
. 2011. Caspase-1-processed cytokines IL-1beta and IL-18 promote IL-17 production by gammadelta and CD4 T cells that mediate autoimmunity. J. Immunol. 186: 5738–5748.
. 1990. Cytokine accumulations in CSF of multiple sclerosis patients: frequent detection of interleukin-1 and tumor necrosis factor but not interleukin-6. Neurology 40: 1735–1739.
. 2009. The analysis of IL-1 beta and its naturally occurring inhibitors in multiple sclerosis: the elevation of IL-1 receptor antagonist and IL-1 receptor type II after steroid therapy. J. Neuroimmunol. 207: 101–106.
. 1992. T cell receptor V alpha-V beta repertoire and cytokine gene expression in active multiple sclerosis lesions. J. Exp. Med. 175: 993–1002.
. 1993. Cytokine mRNA expression in inflammatory multiple sclerosis lesions: detection by non-radioactive in situ hybridization. Cytokine 5: 583–588.
. 1995. The adhesion molecule and cytokine profile of multiple sclerosis lesions. Ann. Neurol. 37: 424–435.
. 1997. Human leukocyte antigens and cytokine expression in cerebral inflammatory demyelinative lesions of X-linked adrenoleukodystrophy and multiple sclerosis. J. Neuroimmunol. 75: 174–182.
. 2006. IL-1beta regulates blood-brain barrier permeability via reactivation of the hypoxia-angiogenesis program. J. Immunol. 177: 5574–5584.
. 2016. Expression of IL-1β in rhesus EAE and MS lesions is mainly induced in the CNS itself. J. Neuroinflammation 13: 138.
. 2014. Cerebrospinal fluid IL-1β correlates with cortical pathology load in multiple sclerosis at clinical onset. J. Neuroimmunol. 270: 56–60.
. 2014. Cerebrospinal fluid detection of interleukin-1β in phase of remission predicts disease progression in multiple sclerosis. J. Neuroinflammation 11: 32.
. 1999. Peripheral levels of caspase-1 mRNA correlate with disease activity in patients with multiple sclerosis; a preliminary study. J. Neurol. Neurosurg. Psychiatry 67: 785–788.
. 2014. The analysis of correlation between IL-1B gene expression and genotyping in multiple sclerosis patients. J. Neurol. Sci. 343: 41–45.
. 2015. Increased inflammasome related gene expression profile in PBMC may facilitate T helper 17 cell induction in multiple sclerosis. Mol. Immunol. 63: 521–529.
. 2014. In acute experimental autoimmune encephalomyelitis, infiltrating macrophages are immune activated, whereas microglia remain immune suppressed. Glia 62: 1724–1735.
. 2014. GM-CSF-responsive monocyte-derived dendritic cells are pivotal in Th17 pathogenesis. J. Immunol. 192: 2202–2209.
. 2014. The inflammasome pyrin contributes to pertussis toxin-induced IL-1β synthesis, neutrophil intravascular crawling and autoimmune encephalomyelitis. PLoS Pathog. 10: e1004150.
. 2016. Blockade of CD47 ameliorates autoimmune inflammation in CNS by suppressing IL-1-triggered infiltration of pathogenic Th17 cells. J. Autoimmun. 69: 74–85.
. 2012. Janus-like opposing roles of CD47 in autoimmune brain inflammation in humans and mice. J. Exp. Med. 209: 1325–1334.
. 2000. Mast cells are essential for early onset and severe disease in a murine model of multiple sclerosis. J. Exp. Med. 191: 813–822.
. 2010. Meningeal mast cells affect early T cell central nervous system infiltration and blood-brain barrier integrity through TNF: a role for neutrophil recruitment? J. Immunol. 184: 6891–6900.
. 2013. Mast cell activation and neutrophil recruitment promotes early and robust inflammation in the meninges in EAE. J. Autoimmun. 42: 50–61.
. 2016. Meningeal mast cell-T cell crosstalk regulates T cell encephalitogenicity. J. Autoimmun. 73: 100–110.
. 2016. Mast cell inflammasome activity in the meninges regulates EAE disease severity. Clin. Immunol. DOI: 10.1016/j.clim.2016.04.009.
. 2016. Expansion of Th17 cells by human mast cells is driven by inflammasome-independent IL-1β. J. Immunol. 197: 4473–4481.
. 2009. IL-1R signaling within the central nervous system regulates CXCL12 expression at the blood-brain barrier and disease severity during experimental autoimmune encephalomyelitis. J. Immunol. 183: 613–620.
. 2013. Interleukin-1β alters glutamate transmission at purkinje cell synapses in a mouse model of multiple sclerosis. J. Neurosci. 33: 12105–12121.
. 2010. Infiltration of Th1 and Th17 cells and activation of microglia in the CNS during the course of experimental autoimmune encephalomyelitis. Brain Behav. Immun. 24: 641–651.
. 2016. T cell-intrinsic ASC critically promotes T(H)17-mediated experimental autoimmune encephalomyelitis. Nat. Immunol. 17: 583–592.
. 2009. IL-1 family members and STAT activators induce cytokine production by Th2, Th17, and Th1 cells. Proc. Natl. Acad. Sci. USA 106: 13463–13468.
. 2009. Critical regulation of early Th17 cell differentiation by interleukin-1 signaling. Immunity 30: 576–587.
. 2010. Generation of pathogenic T(H)17 cells in the absence of TGF-β signalling. Nature 467: 967–971.
. 2011. Fate mapping of IL-17-producing T cells in inflammatory responses. Nat. Immunol. 12: 255–263.
. 2011. RORγt drives production of the cytokine GM-CSF in helper T cells, which is essential for the effector phase of autoimmune neuroinflammation. Nat. Immunol. 12: 560–567.
. 2011. The encephalitogenicity of T(H)17 cells is dependent on IL-1- and IL-23-induced production of the cytokine GM-CSF. Nat. Immunol. 12: 568–575.
. 2013. CD28-inducible transcription factor DEC1 is required for efficient autoreactive CD4+ T cell response. J. Exp. Med. 210: 1603–1619.
. 2014. Bhlhe40 controls cytokine production by T cells and is essential for pathogenicity in autoimmune neuroinflammation. Nat. Commun. 5: 3551.
. 2014. Loss of Sprouty4 in T cells ameliorates experimental autoimmune encephalomyelitis in mice by negatively regulating IL-1β receptor expression. Biochem. Biophys. Res. Commun. 447: 471–478.
. 2016. The microRNA-183-96-182 cluster promotes T helper 17 cell pathogenicity by negatively regulating transcription factor Foxo1 expression. Immunity 44: 1284–1298.
. 2016. Generation and characterization of mice expressing a conditional allele of the interleukin-1 receptor type 1. PLoS One 11: e0150068.
. 2016. Characterization of a conditional interleukin-1 receptor 1 mouse mutant using the Cre/LoxP system. Eur. J. Immunol. 46: 912–918.
. 2016. Generation of a novel T cell specific interleukin-1 receptor type 1 conditional knock out mouse reveals intrinsic defects in survival, expansion and cytokine production of CD4 T cells. PLoS One 11: e0161505.
. 2014. Interleukin-1β induces blood-brain barrier disruption by downregulating Sonic hedgehog in astrocytes. PLoS One 9: e110024.
. 2015. Control of autoimmune CNS inflammation by astrocytes. Semin. Immunopathol. 37: 625–638.
. 2015. Interleukin 1 type 1 receptor restore: a genetic mouse model for studying interleukin 1 receptor-mediated effects in specific cell types. J. Neurosci. 35: 2860–2870.
. 2017. Involvement of the IL-1 system in experimental autoimmune encephalomyelitis and multiple sclerosis: breaking the vicious cycle between IL-1beta and GM-CSF. Brain Behav. Immun. 62: 1–8.
. 2014. Neutrophils mediate blood-spinal cord barrier disruption in demyelinating neuroinflammatory diseases. J. Immunol. 193: 2438–2454.
. 2011. Endothelial IL-1R1 is a critical mediator of EAE pathogenesis. Brain Behav. Immun. 25: 160–167.
. 1987. Expression of interleukin 1 receptors on human peripheral T cells. J. Immunol. 138: 4243–4248.
. 2010. Regulating human Th17 cells via differential expression of IL-1 receptor. Blood 115: 530–540.
. 2016. Activated IL-1RI signaling pathway induces Th17 cell differentiation via interferon regulatory factor 4 signaling in patients with relapsing-remitting multiple sclerosis. Front. Immunol. 7: 543.
. 2014. IL-1β promotes the differentiation of polyfunctional human CCR6+CXCR3+ Th1/17 cells that are specific for pathogenic and commensal microbes. J. Immunol. 193: 120–129.
. 2006. A role for CXCL12 (SDF-1alpha) in the pathogenesis of multiple sclerosis: regulation of CXCL12 expression in astrocytes by soluble myelin basic protein. J. Neuroimmunol. 177: 27–39.
. 2014. Regulation of astrocyte activation by glycolipids drives chronic CNS inflammation. Nat. Med. 20: 1147–1156.
. 1996. Circulating serum levels of IL-1ra in patients with relapsing remitting multiple sclerosis are normal during remission phases but significantly increased either during exacerbations or in response to IFN-beta treatment. Cytokine 8: 395–400.
. 2000. Interleukin-1 receptor antagonist, soluble tumor necrosis factor-alpha receptor type I and II, and soluble E-selectin serum levels in multiple sclerosis patients receiving weekly intramuscular injections of interferon-beta1a. Eur. Cytokine Netw. 11: 81–86.
. 2008. Induction of serum soluble tumor necrosis factor receptor II (sTNF-RII) and interleukin-1 receptor antagonist (IL-1ra) by interferon beta-1b in patients with progressive multiple sclerosis. J. Neurol. 255: 1136–1141.
. 1997. Interferon-beta not only inhibits interleukin-1beta and tumor necrosis factor-alpha but stimulates interleukin-1 receptor antagonist production in human peripheral blood mononuclear cells. Eur. Cytokine Netw. 8: 345–349.
. 2001. IFN-beta inhibits the ability of T lymphocytes to induce TNF-alpha and IL-1beta production in monocytes upon direct cell-cell contact. Cytokine 14: 272–282.
. 2011. Type I interferon inhibits interleukin-1 production and inflammasome activation. Immunity 34: 213–223.
. 2009. Glatiramer acetate increases IL-1 receptor antagonist but decreases T cell-induced IL-1beta in human monocytes and multiple sclerosis. Proc. Natl. Acad. Sci. USA 106: 4355–4359.
. 2012. Monocytes P2X7 purinergic receptor is modulated by glatiramer acetate in multiple sclerosis. J. Neuroimmunol. 245: 93–97.
. 2010. Glatiramer acetate triggers PI3Kδ/Akt and MEK/ERK pathways to induce IL-1 receptor antagonist in human monocytes. Proc. Natl. Acad. Sci. USA 107: 17692–17697.
. 2011. IFN-β and glatiramer acetate trigger different signaling pathways to regulate the IL-1 system in multiple sclerosis. Commun. Integr. Biol. 4: 112–114.
. 2010. Natalizumab treatment in multiple sclerosis: marked decline of chemokines and cytokines in cerebrospinal fluid. Mult. Scler. 16: 208–217.
. 2012. Association between change in normal appearing white matter metabolites and intrathecal inflammation in natalizumab-treated multiple sclerosis. PLoS One 7: e44739.
. 2007. HSV-1-mediated IL-1 receptor antagonist gene therapy ameliorates MOG(35-55)-induced experimental autoimmune encephalomyelitis in C57BL/6 mice. Gene Ther. 14: 93–98. 2007. Role of IL-1 and potential therapies in multiple sclerosis. Drug Discov. Today 4: 19–24.
. 2012. Treating inflammation by blocking interleukin-1 in a broad spectrum of diseases. Nat. Rev. Drug Discov. 11: 633–652.
. 2016. Interleukin-1 function and role in rheumatic disease. Nat. Rev. Rheumatol. 12: 14–24.